Suzanne started with my son just before he entered high school, he had never played golf up until that point. 4 years later he was given the opportunity to play at the collegiate level. His success is a direct result of the fundamentals, work ethic, and overall knowledge that she passed on to him. Suzanne also possesses an uncanny way of making you feel like you are her only client. I have been involved with sports all of my life. I was a runner, tennis player and kayaker. When my knees started to show their wear from years of fun I thought my sporting days were over. I am 64 years old. One day last spring my sisters signed us up for a series of golf clinics. I went mostly for the fun of doing something with my sisters. That was until I met Suzanne. I was immediately impressed with her intelligence and skill but especially with her sense of humor. Golf was fun and that is what I was looking for. I not define Golf as "Fun Finetuned by Suzanne". Golf with Suzanne has given me a wonderful new sport that I intend to play for the rest of my life and that is a very special and that is a very special gift. Suzanne Noblett is a refreshingly effective golf instructor. Suzanne's strong suit is her ability to identify HOW a person learns. She has an arsenal of teaching aides, visual cues, verbal triggers, and drills at the ready to help each student understand the swing better. Her teaching is customized to each individual student. flavored with a passion to help each and every student. Suzanne really simplifies the game of golf. She helped me with my grip, stance and getting rid of my slice. It’s always nice to get a refresher when my game starts to go south. My husband and I were very new to golf when we met Suzanne. In fact, golf was a discouraging, frustrating and humiliating experience for me…I wasn’t having much fun. Then Suzanne, in her calm and reassuring way, helped me to begin to understand that it’s a game and that it’s supposed to be fun. My mental attitude had a lot to do with how I played. She started with the basics and helped me to progress from being a hacker to having a golf swing I can be proud of. Suzanne Noblett was the best thing to happen to us since we first picked up a putter. I really enjoy Suzanne’s golf instruction style. She makes each lesson fun, yet filled with lots of stroke saving drills, tips and ideas that have an immediate impact on your golf scores, without making you revamp your entire swing. Even having a low handicap, I’ve still been able to shave nearly six strokes off my average golf scores. After years of trying to teach myself from videos, books and magazine articles, I’ve concluded that the only way you’re going to break 90, 80, or 70 is through professional golf instruction. 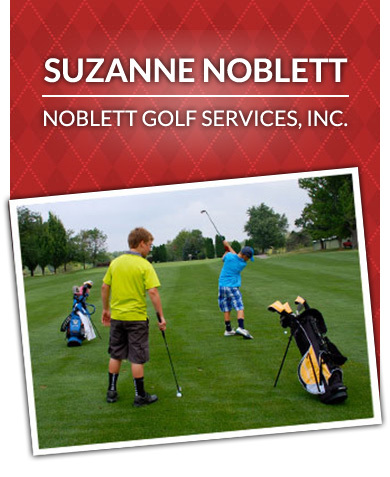 Suzanne Noblett should be the golf professional at the top of your list to call right now! Suzanne has a very creative and inspirational approach to teaching. She has improved my golf game and helped me stay strong and positive through the learning process. My lessons with you this past spring and summer were the very best gift I ever gave my self. You listened carefully to my goals and my desire to improve my game. After careful analysis of my skill level, you developed a tailor made program to help me achieve those goals. Thank you for your help! Your method of teaching is super! Suzanne is a fantastic instructor that not only teaches golf technique, but cultivates a love for the game that will last our family for a lifetime.